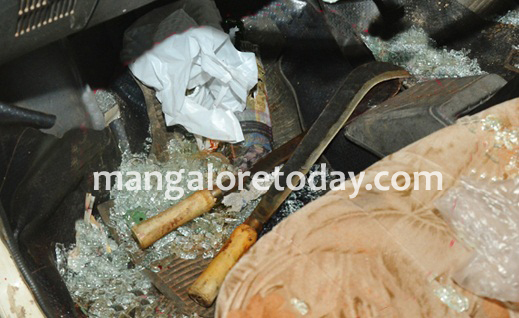 Gang Rivalry- Two youths escape murder attempt in Mangaluru. 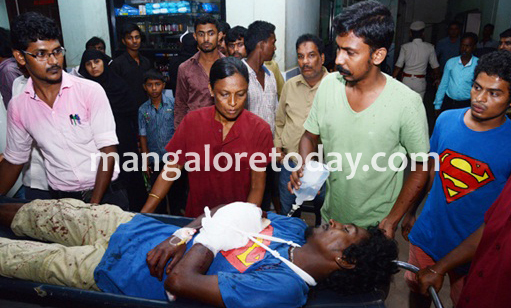 Mangaluru: Ju;y 28, 2015: Two youths were brutally assaulted by two miscreants with lethal weapon on Monday evening in the city. The injured youths have been identified as Inderjit and Lathish, and are said to be in critical condition. One of the assailants has been identified as Ravichandra alias Vicky Poojary of Kodikal, a rowdy sheeter. The attackers came in a Maruti 800 car, and brutally assaulted the youth with the lethal weapons in a bid to murder them. When the people began to shout after the horrific incident, the frightened assailants escaped from the spot by their car. However, they rammed into three cars which obstructed them while escaping. The car stopped at Mannagudda as it developed technical snag. They got off the car and escaped with the bike by pushing the riders on to the ground in a filmy style. The injured were rushed to the hospital. The police recovered Machetes that were wrapped in a cloth. The Kadri police have taken up the investigation and are searching for the accused. Why are the humans behaving so cruelly?